Heartware Support Our Pioneers (HWSOP) empowers youth to serve the needs of the elderly through visitations, activities and outings. 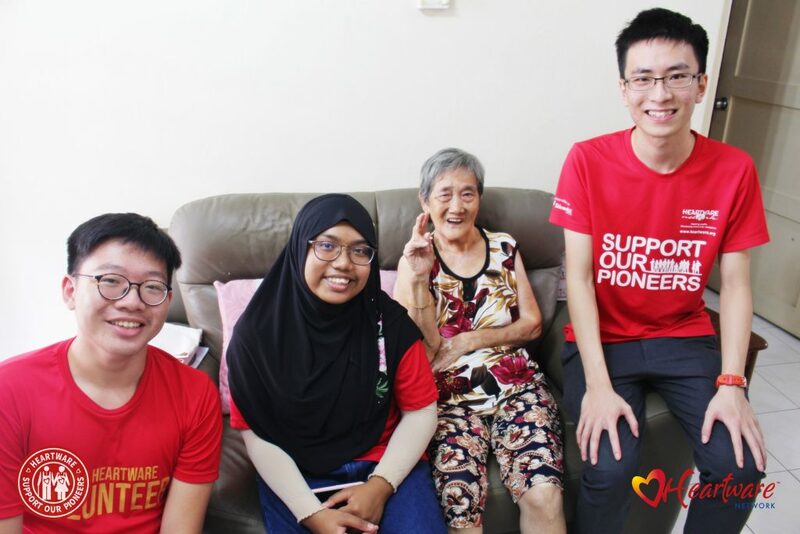 In this fast-ageing society, youths take ownership to bridge inter-generational divides, and promote active aging by first fostering tight bonds with the pioneer generation. We sat with Jaron Lim, student of National Junior College and volunteer for HWSOP, to pick his brain on the impressions he had of the seniors at Taman Jurong, and what kind of senior he hopes to be in future. 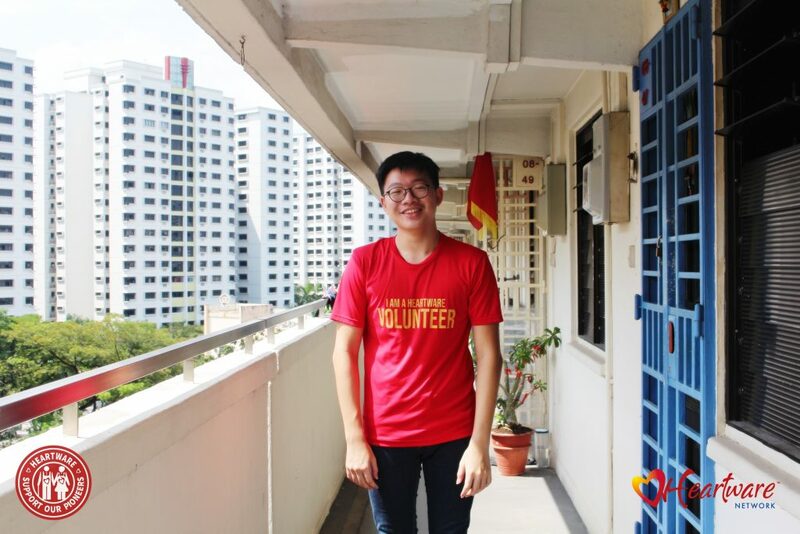 Having volunteered a year, Jaron is in his element amongst the units of rental blocks in Taman Jurong. How do you find the programme? It’s been great with all those experiences with the elderly. I especially found it pretty interesting when the seniors begin to complain. They go on and on… but hearing them talk about their own lives is very interesting. Are there elderly who went through illnesses in the process of these visitations? On and off. Like the elderly I just visited, the daughter in-law fell down. Then a few weeks ago, she got hospitalised. She is quite big-sized too. And she is taking a lot of medications – I see her pills were like, around ten? That’s a lot. There is also another senior who had something stuck in her throat at the start of the year. I’m not sure if it’s tumor. She said she went to Ng Teng Fong Hospital where the doctor suggested to do something about it, but when she visited the polyclinic doctor, he had said otherwise. It was conflicting, and she didn’t know what to do. She ended up going to National University Hospital to remove the growth because every time she swallows, it is very hard for her. Recently, the last time we saw her, she had a tube attached so she could down her food. She was very upbeat at the start of the year until more recently, she started to tone down and wasn’t lively anymore. The first visitation I came, her husband had passed away 2 months before. Her husband was bedridden, as what I was told. However, I haven’t seen any deaths in my process of visitation. Even if for a while, Jaron and his fellow volunteers stay to chat with seniors from outside their gates, to check up on them and lend a listening ear. When you enter their houses, some spaces are really cluttered and some are incredibly clean. Do you think it is very telling of their personalities? Each of them have different personalities, but we can’t judge them from how clean their houses are. It depends more on whether they have the time to clean. For example, the senior living on the tenth floor has to take care of her mother and there isn’t much time to clean the house. Then for the elderly living on the third floor, occasionally there is someone who comes to clean his house 3 times every year. These are students or volunteers. It depends on how many volunteers could come to clean their houses, or if they could clean by themselves. But some unable to do so. Talking about houses, there is a house that I found interesting, house with cats. The mother cat had two babies, but one of them fled and it was never found again. Usually the houses won’t have much pets but that was an exception. Volunteers usually visit the elderly in groups; the more the merrier. What was a perspective gained that you never had before? After going through this programme, I feel more mature because we now understand where the seniors come from. There were a lot of perspectives shared, and I experienced many situations. In and out, there were some family arguments and we were caught in the middle of it. Once, the wife was quarrelling with the husband whom we barely see because he was usually in the room. We were sharing with the seniors about HELIOS, but he misunderstood our intentions and thought we were up to no good. Then we didn’t know what to do. We tried to calm them down but we also didn’t try to get ourselves too involved because we might open a new can of worms accidentally. Then it might have gotten more heated. Eventually, we just left the house. How do you imagine yourself as a senior, years later? When I grow old, I want to go around, occasionally passing by people and helping them out. Maybe if I suspect something might happen based from all my experiences here, I can be there to help. I want to be someone who while going about my daily activities, I can help my neighbours too. Helping out others is really fun. I don’t know why… I guess something I feel in my body – a sense of satisfaction. It’s nice. Recruitment for Heartware Support Our Pioneers 2019 is now open! Know more on how you be a companion to our seniors here.